Fulginiti & Associates, LLC represents clients in Princeton, NJ and throughout Mercer, Middlesex, Hunterdon, Somerset, and Monmouth counties with Residential Real Estate, Commercial Real Estate, Land Use/Zoning, Business Law, Trusts & Estates, Employment Law, Tax Law, Civil Litigation and Traffic Court defense. 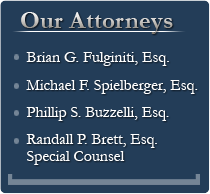 Contact our Princeton, NJ Law office to schedule a consultation with one of our attorneys. Our firm takes the lead in providing representation and advice to our clients. Fulginiti & Associates, LLC represents clients in Princeton Borough, Princeton Township, East Windsor, West Windsor, Cranbury, Montgomery, South Brunswick, Hopewell, Burlington, Hightstown, Hamilton, Ewing, Plainsboro, Belle Mead, Lawrence Township, Kendall Park, Pennington, Hillsborough, Trenton, Robbinsville and throughout New Jersey. We also represent clients in Bucks and Montgomery counties in Pennsylvania and in the state of Florida.